This entry is going to be the first part to a 3 part series on developing strategy in fighting games. Be forewarned, this is not a simple concept. Though it can be utilized at a low level, I might prioritize other things like learning the games engine and the like over crafting a complex strategy. However, creating an effective strategy is a concept you must have to improve in fighting games. Simply playing matches with no direction may get you a few wins but at higher levels, you’ll likely get destroyed. Because currently I’m learning the character Yang in Ultra Street Fighter 4, this guide will focus mainly on him. That said, the concepts and ideas here can be transferred over to any character. If you have any questions, feel free to leave me a comment below! Yang is a character with a multitude of tools and has access to everything…. except big damage. This can make it a struggle for players to continue to use Yang, because frankly speaking his comeback potential is rather low. The strategies written below are a focused look at Yang’s moveset, damage, and abilities to create a streamlined and incredibly effective way to play the character. This guide takes into account things like meter, damage output, spacing, etc. that can be used in a variety of matches. What you read here may differ from some of your opinions, and that’s fine. I’d love to hear some ideas shared and thoughts coalesced into a cohesive strategy; however, my purpose for creating this is to help people so that THEY HAVE A PLAN . With the introduction out of the way, let’s first take a look at Yang as a character. When you think of Yang, what strengths come to mind? What are some of his weak points? What tools does he have? I’ll let you mull it over, but if you need a hint there are a few listed below. These points are what I think in summary make Yang the character he is. So let’s take a little bit more of a in-depth look at each of Yang’s pros and cons. Yang’s teleport, divekick, and other interesting move properties give him access to rather tricky standing reset techniques that are quite difficult to block in time. 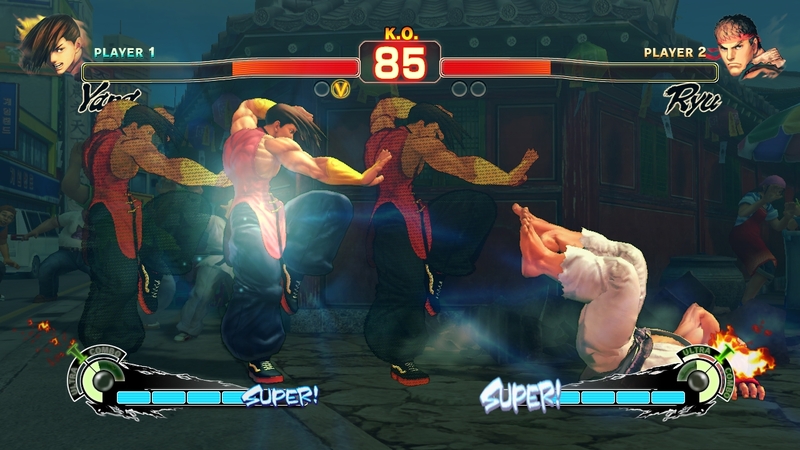 In addition, Ultra Street Fighter 4 granted him an improved jumping cross-up attack hitbox. All of this is combined with his offensive tools make a character that has the options to mixup an opponent in a variety of ways. Yang has some of the best normals for punishing in the whole game, not to mention good hitboxes. These allow him to play a very solid ground game that can easily frustrate the opponent. Not to mention his ability to buffer into his rekka attacks, to put additional pressure on the opponent. Yang’s wonderful normals combined with his strong ground movement give him some really effective footsies, and great ability to counter-poke his opponents. If that wasn’t already enough, he also has a divekick, which allows him to bypass all of those footsies, if his opponent can’t handle it. I would say that to be used most effectively, divekick should not replace your footsies game, but should supplement it. Think of it as another tool in the shed, not the only tool in the box. Yang has 900 HP and 950 Stun, which is crappily low, for a game like street fighter 4. This means he needs to be played with great tact and care. Throwing large haymakers with this character will surely land you in the emergency room in now time. Yang has very low damage for confirms and BnB’s. Even his midscreen punishes without meter are lacking in the damage department. Even some of his damaging moves, require lots of start-up and can’t be comboed into from his normals. This is one of the most defining features of Yang, and as a Yang player you’ve probably noticed that this character takes more hits than most to down an opposing character. Yang’s character design is truly that of someone who has all the tools, but none of them are the best tool. If you want a faster divekick, play Yun, if you want faster command grabs, play Abel, if you want a better uppercut, play Ryu. In every area, Yang is never the best. There is someone that does one of the things he does, but better, but he is the only character who has access to them all. It truly takes solid play and creativity to win with this swiss army knife of a character. So that will do it for the first part of the guide. Think about your own character? What are their strengths? What are their weaknesses? try to come up with your own list of the top 3 or top 4 things. In the next section we’ll learn how to put our list to use to start crafting the perfect strategy! Is it ok if we use sort of as a template for our own websites as well? what do you mean? Like the format or the information? Sure, go nuts. I’d love to see it when it’s finished!